This would be Dr. King’s final struggle, as he was assassinated while helping to build this movement. 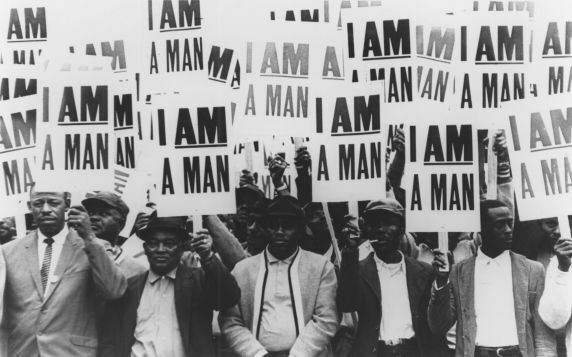 Yet the sanitation workers would go on to win their strike, and on April 16, 1968 reached a settlement that included union recognition and wage increases. Today, educators would do well to remember the lesson of the power of fusing civil rights movements with labor activism. As public education and teachers come under increasing attack by corporate education reformers, educators today are being forced to defend their very humanity. Well-funded but non-accountable organizations, such as the Broad Foundation and the Bill and Melinda Gates Foundation, have invested their wealth to promote the policies of “No Child Left Behind” and “Race to the Top”. 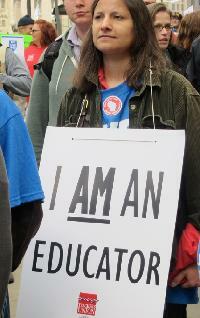 These policies that purport to demand teacher accountability but ultimately reduce students and teachers to test scores–data points used to fire teachers, narrow the curriculum, keep students from graduating, privatize education, and close down scores of schools (primarily those that serve Black, Latino and students of color) across the nation. In a particularly inhuman attempt to transform living, breathing, teachers into lifeless bits of data, the Los Angeles Times published a 2010 article titled, “Who’s Teaching L.A.’s Kids?”, which provided rankings of some 6,000 teachers according to student test data and sorted them into the categories of “Most effective, more effective, average, less effective, or least effective.” One LA public school teacher described the brutality of the LA Times’ publishing of her test scores, saying it made her feel “like I was on public display, like a human being on the auction block or something.” LA educator, Rigoberto Ruelas, a popular fifth-grade teacher in a Los Angeles’ Miramonte Elementary, committed suicide soon after the publication of his test scores labeled him “less effective.” Suicide rarely has a single cause, and is usually is the result of many socially preventable hardships, but friends reported that Ruelas had been distraught specifically because of his public shaming over the test scores of his students. It is astounding and shameful that the bankers who sabotaged the global economy–which exacerbated the social conditions and lack of opportunity that contributed to the underperformance of Rigoberto’s students–remain free from persecution, yet public shaming of our educators is celebrated as “accountability” and the key to the betterment of the nation. 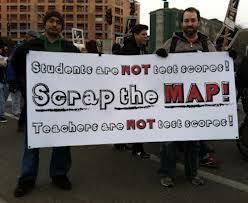 However, a new movement is emerging across the country to assert that teachers and students are more than a test score and that the intellectual process of teaching and learning cannot be measured, or inspired, by bubbling answer choice “E.” In the first months of 2013 alone, Seattle teachers have launched a historic boycott against the MAP test, students in Portland have walked out of school in protest of the standardized OAKS exam, students in Chicago have staged a walkout against the both standardized testing and school closures, hundreds of parents in Long Island have opted their children out of a high stakes test, and some 10,000 parents, students, and educators in Texas have rallied against the over use of testing in the public schools. As our movement develops, it would do well to advocate an alternate vision for education that is, as Paulo Freire asserted, to liberate our young people from oppression, rather than to make the United States more competitive in the global economy. This is a vision of education where the purpose is to develop social responsibility, creativity, leadership, and critical thinking—skills young people will need to challenge the dire problems we face today such as war, mass incarceration, economic collapse, and climate change. 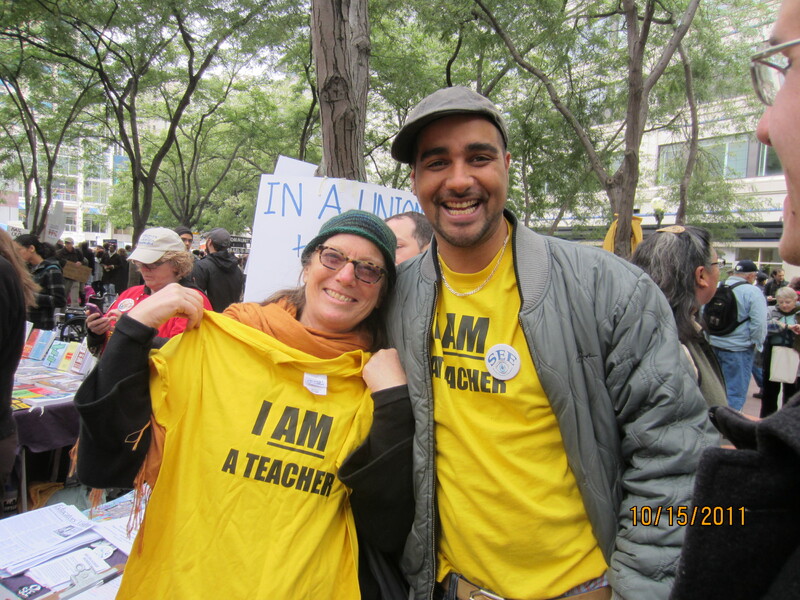 I AM AN EDUCATOR is a new website dedicated defending the humanity of the educator and a vision of education that contributes to creating a socially just society. Mr Hagopian I assume that you will sue the Seattle Police Dept. rather than accept an apology as the man with the golf club seems to have done. It seems appropriate that the officer be fired or go through significant retraining and apologize to you in writing as well. The video is so clear that that police officer (she) sprayed it right at you. A copy of the check and the apologize hanging on the wall. It can never be undone but it can be made right for you personally and for the community by the officer gone or retrained. The current phase of the effort to place the millstone started by their own admission in 1989 in Milwaukee, Wisconsin, with just a few hundred children who were poor and black (other minority children were included but few participated). It was represented to the public that these poor black children did not have the same “advantage” as the white children in Milwaukee, and so the Choice School program* was created by the Wisconsin State Legislature to allow poor minority (black) children to attend a school of their parent’s choice which in essence meant attending a Religious school if it was going to be a better school. As with all “big” City school systems, in 1989, the poor black children who attended Milwaukee’s Public Schools (MPS) did not do as well as their white counterparts. In fact, a disproportionate number of the black children, primarily young black male children, were not learning, were not graduating from high school, and so this became the MORAL basis for the Voucher School program and society’s failure to address their failure is a MORAL concern MORAL failure. The Voucher School program would provide poor black children a chance to attend better if not good schools. It is important to understand that the black children NOT LEARNING, NOT GRADUATING was the MORAL basis, the foundation, of the Voucher School program. It is CRITICAL to understand that black children NOT LEARNING, NOT GRADUATING, TODAY, STILL IS the MORAL basis for, not only Wisconsin’s Voucher, Charter and Choice School programs, but, the whole National Charter School movement as well. Dr. Howard Fuller and others claimed that it was the FAULT of Milwaukee’s Public Schools (MPS) that those poor black children were not learning, and it was also the FAULT of the Milwaukee Teacher Education Association (MTEA) that kept “bad” teachers teaching, so both Public Education and the Teacher’s Union were BAD, and the millstone was attached to both! And so here we are today trying to figure out WHAT TO DO. Mind you that we have been trying to figure out WHAT TO DO for the past thirty years. This begs the question of WHO should have figured out what was happening and WHO should have directly addressed the MORAL issue of black children (young black male children) not learning. Not only were they not learning but were being ignored as well!! To be fair there surely have been efforts made to address young black males not learning, not graduating and yet as we all know much of that effort have been for naught. * I will leave for others to figure out the exact history of who did or did not make the critical observations that you will see are in the final analysis, simple and very basic. Please note that Dr. Fuller says he started working with Rep. Polly Williams in 1989 but he does not become the Superintendent of MPS, the largest Public Schools system in Wisconsin, until 1991 and holds that job for 5 years while cutting all of the manual arts classes out of the High Schools. So in the name of black children who were not learning, (the MORAL failure of society) Dr. Howard Fuller began the systematic attack on the Teachers Unions and on Public Education itself. The RIGHT supported Dr. Fuller, and Representative Annette Polly Williams and they became the mechanism to attack the MTEA and MPS. That was the first step in the plan to privatize Public Education*. It needs to be noted that research addressing why young black children and young black males in particular were not learning would have been the MORAL action to take but the RIGHT made sure that institutions (Public Education and Teacher Unions) that are the people’s would be systematically attacked and destroyed. While the Teacher Unions have Presidents and public relations staff to express the views of their members, WHO SPEAKS FOR PUBLIC EDUCATION? Yes as Dr. Seuss asks, WHO speaks for the trees? The concept of “Public Education”, has been commandeered by the RIGHT, to mean Central City Black Education. The simple proof of that is that there are thousands of high performing schools in the U.S. that are PUBLIC SCHOOL. PUBLIC SCHOOLS WORK and yet the RIGHT has convinced many Americans that PUBLIC SCHOOLS and therefore PUBLIC EDUCATION is broken, and therefore needs to be SAVED, by associating public education with central city education which is equated to the education of black children. Most unfortunately for the children there has been lots of hand wringing but NO RESULTS. While the numbers of black children who fail may be lower today than 30 years ago, the effects of today’s failures still haunts not only the immediate community but the cities themselves. The violence, the senseless deaths, in our large cities is horrifying and YET there is NO VISION of how to address the MORAL FAILING that young Black males are not learning, not graduating! The one seems to be unconnected form the other when in fact they are JOINED at the HIP! How do we proceed? We know that the millstone is a MORAL concern, the failure to educate black children primarily young black male children. Yes that is the millstone but what causes black children and in particular young black males to fail? That is the question that Dr. Howard Fuller and our Universities Public and Private should have addressed 30 years ago and it still the question that needs to be address today. The reading ability of the children between those two schools will also be different but that is an indicating that the problem starts at an earlier age and not in the high school. Yes it starts in first grade and yes it starts in the home before that and gradually builds as the behavioral issues are first squashed and then with age become unmanageable. But what is it about the behavior that can be addressed? The work of Dr. Lonnie Athens lays out very clearly that unresolved abuse/trauma is the foundation to all violent behavior. What Dr. Athens also observed, and is critical for all educators AND ALL OF US to understand, is that all abused/traumatized individuals who have NOT RESOLVED their abuse/trauma will become belligerent – will become so angry that they begin to act out. That acting out is either external – against others – or internal – against themselves. What is critical to understand is that the belligerent behavior must NOT be seen as an affront to authority BUT a child’s CRY FOR HELP. The “CRY” is no different from a baby’s cry. In large part we know how to respond to a baby’s cry. WHAT WE DO NOT KNOW, IS HOW TO REPOND TO A CHILD’S BELLIGERENT BEHAVIOR. We need to learn how to positively respond to a child’s belligerent behavior!! A friend who was an assistant principal at a middle school could set her watch when a girl would come into her office. Finally, she told the girl that they needed to have a long talk before lunch. After a long pause the girl blurted out that her brother had died from sickle cell anemia. Before the assistant principal could get her arms around the girl to hold her, the girl further revealed that she, too, has sickle cell anemia. She did not know if or when she would die, and her family had not listened or responded sufficiently to her cries for help. Most would deem this, the family’s responsibility, not the school’s responsibility. But the girl was failing, the girl was disruptive, and so it became the school’s issue. Her UNRESOLVED trauma in this case needed to be resolved for her own good as well as the good of the school and MPS itself. The other story is one told by a social work who took time to listen to a boy who was doing good work, but then in a very short period of time, things fell apart. As the boy talked, it came out that he was homeless in that they had moved in with relatives, and he was sleeping in the basement. But that was not the problem. The real issue was that he did not have a blanket to cover himself. This so upset him (traumatized him) that he became belligerent. Once a blanket was provided, he went back to doing good work once again. It is easy to see how this story could have ended without he blanket. These two statements are diametrically opposed. Either a child’s belligerent behavior is personal and intentional or it is a response to the unresolved abuse/trauma that the child has experienced. We have for years approached a child’s belligerent behavior as a personal and intentional act. That the child WANTS to be disruptive enough so they can be suspended from school etc. Schools have tried to control and change the belligerent behavior without realizing that there is something that is causing the behavior. What is causing the belligerent behavior? They have not understood that for many children, their belligerent behavior is a cry for help to resolve the unresolved abuse/trauma that he/she has or is experiencing, not an affront to authority much less a threat to their personal safety. Understanding Schools that are not succeeding is like learning a NEW computer program. At first it all seems very complex and yet once you have learned the program, it is, very easy to use. That is the complexity of what we are dealing with. The elements are basically understood it is the arrangement of the elements that at first seems complex yet once understood it is in fact easy. E) The abuse/trauma can be as simple as a young boy not having a blanket or as horrific as a girl of 11 being raped by her uncle for 2 years and then by her cousin for another 2 years. The boy got his blanket because a teacher took the time to ask him WHY he was so upset and to LISTEN to him. The girl of 11 was not as lucky, she raged all through high school but NO ONE ASKED WHY! NO ONE LISTENED because they ALL KNEW THAT SHE WAS A SPOILED RICH KID. These are the elements it is first understanding them and then applying them that leads to proficiency!! * There are a number of issues that I will only make reference to. I am not an academic nor am I Chris Hedges, so please bear with me here. Saving public education. Providing all students with lessons and skills for life, to address challenges creatively and collaboratively, to become informed participants in a free society, and most importantly to become good parents. It’s always nice to have a few things to work on. 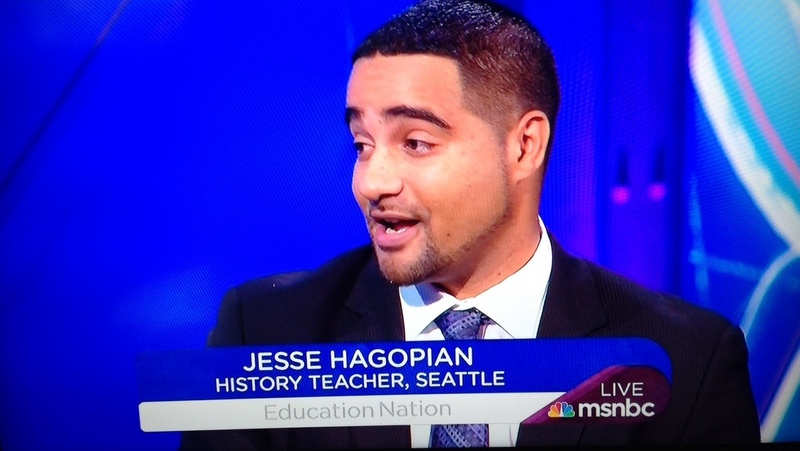 Jesse Hagopian is up to the job. Thanks for being an educator. Win over those humans in those mega corporations. Speak to their heart and will , to act according to their knowledge of what is fair and just; and profoundly doable. Convince them to be rich beyond their wealth. from now on this webpage for moviestarplanet hack free can generate starcoins and diamonds. And everybody is talking about this website which can get free itunes codes for you and can be used at the iTunes.